The Real Ghostbusters is an animated television series, a spinoff of the 1984 comedy movie Ghostbusters. The series ran from September 13, 1986 to October 5, 1991, and was produced by Columbia Pictures Television, DiC Enterprises, and Coca-Cola Telecommunications. J. Michael Straczynski was story editor, and wrote episodes for every season except four and seven. 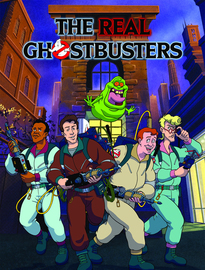 "The Real" was added to the title after a dispute with Filmation and its Ghost Busters properties. The series continues the adventures of paranormal investigators Dr. Peter Venkman, Dr. Egon Spengler, Dr. Ray Stantz, Winston Zeddemore, their secretary Janine Melnitz, and their mascot ghost Slimer. There also were two ongoing Real Ghostbusters comics, one published monthly by NOW Comics in the United States and the other published weekly (originally biweekly) by Marvel Comics in the United Kingdom, and a popular toy line manufactured by Kenner.